150 local and international artists with the support of 40 committed volunteers and crew. The Arts can touch the heart of man, giving him the inspiration of life. The Arts give form to our expressions, create what we see, stimulate what we think, create our environment, design what we use, as well as stimulate creativity and change. As individuals we all have something to contribute to the Arts. When we draw this inspiration through our national heritage and create as an expression of our own culture, insignificance is better appreciated. is offering just such an appreciation: a multi-national, multi-dicipline gathering of the Arts with a pure intention at its core. 1 particular concern with the in sufficient education and exposure the Arts receive in general and especially in Indonesia. 2. To encourage and facilitate local and international in the inter-cultural exchange and collaborations. Festival à la Carte is something unique: a festival with a deep-rooted commitment in leaving behind a legacy to the Arts. The community at large will experience the benefits. The success of Festival à la Carte will depend on the level of interest and the degree of participation of those involved. By having your organization participate in Festival à la Carte you will not only gain exposure for your own objectives, aims, ideals and values, but you will also be contributing an essential social and educational service to the people. 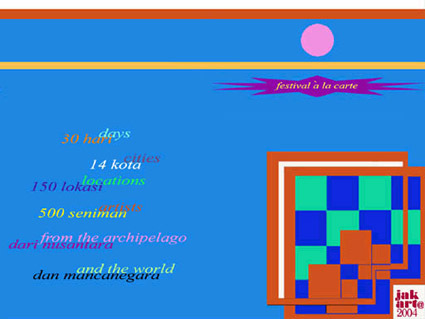 Join Festival à la Carte in helping us make this reality. • In collaboration with over 200 government and NGO organizations & associations, foreign embassies, etc. In July 2003, the concept/creation “Homage to the Eternal Creativity of the Human Race”. The installation / exposition presented was a sketch of atmospheric impressions suggesting the scope and possibilities of the proposal for the creation of a traveling and fully comprehensive chronological Educational Exposition of the most important examples of art produced throughout human history around the world. From the cave dweller to the present, in the form of museum replicas in an “atmospheric” context using material from both the Tangible Heritage and National Museum in Jakarta, was officiated by the Director General of UNESCO, Mr. Koichiro Matsuura and the Indonesian Minister for Culture and Tourism, Mr. I Gede Ardika.